Haiti Finally Has A President-Elect, 14 Months After Elections Began : The Two-Way After various rounds of voting were annulled, canceled, rescheduled and challenged, Haiti's electoral council has declared businessman Jovenel Moise the winner. He'll be sworn in on Feb. 7. A protester holds a photo of presidential candidate Jovenel Moise near the headquarters of the Provisional Electoral Council in Port-au-Prince last April, as demonstrators demanded that elections be held. Haiti's tortuous election process dragged on for more than 14 months before Moise was declared the victor. 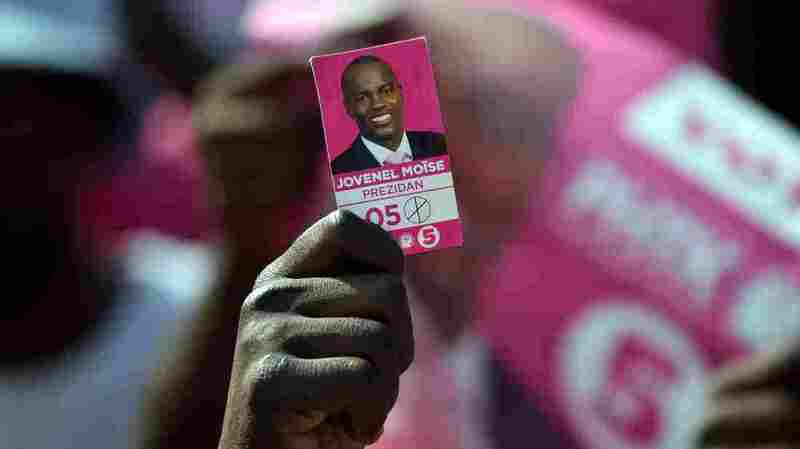 Businessman Jovenel Moise will be the next president of Haiti, the country announced. His victory ends a drawn-out and difficult election process that has stretched on for 14 months. Moise is a wealthy businessman who made his fortune exporting fruit (he's known as the "Banana Man") and has never held office. He's from the same party as former President Michel Martelly, and won handily in a crowded field. The Associated Press reports that Moise earned more than 55 percent of the first-round votes, with 26 other candidates in the running, according to Haiti's Provisional Electoral Council. An electoral tribunal found "no evidence of large-scale voter fraud" that would nullify the results, the AP reports. "Some irregularities" in the Nov. 20 vote were detected, "but not enough to affect the outcome based on an analysis of 12 percent of the ballots," the wire service writes. Moise will be sworn in on Feb. 7, according to news reports. The announcement of a new president-elect is long overdue in Haiti. This election began all the way back in October 2015, with first-round voting and 54 candidates. As NPR's Rebecca Hersher has reported, the U.S. says it spent $33 million to support that election. Opposition leaders and human rights groups alleged "widespread fraud and vote rigging" in that vote, NPR's Carrie Kahn has reported. Moise won a plurality of votes in that election, but no one won an outright majority, sending the election to a runoff. That second round of voting was delayed multiple times in December 2015 and January 2016, with officials saying they were concerned about violence. President Michel Martelly stepped down without a successor, and an interim president took over. The overdue second-round elections were scheduled for April 24. "That day came and went without a vote," Rebecca reported. In June, the results from October 2015 were annulled and Haiti decided to start the process over. The new elections were scheduled for the fall of 2016 ... and then Hurricane Matthew slammed into Haiti, with devastating consequences. So the vote was rescheduled, again. On Nov. 20, voters returned for the second round of first-round elections. This time Moise won outright, eliminating the need for a runoff vote later in January. But rivals challenged the results, leading to the electoral tribunal, which announced Tuesday that Moise's victory was official. Supporters of opposition parties burned tires and marched in protest, the AP reports, but no significant unrest was reported.